WOOO HOOO!!!! Most fun I've ever had at the Chiles Center. Keep it rolling, Pilots! At halftime one GU fan said to me, "where have you been hiding this UP basketball team all year?" Well, it's obviously the same team we've been watching all season, but IMO the coaches let the guys just go out and play with the knowledge they’d been coaching them as well as they could since last July, and they were finally ready to FLY on their own. And fly they did……with confidence and wonderful instinct....how else to you explain 8 blocked shots and 8-14 from behind the arc? Bryce played at another level this evening...much like he did in Las Vegas against Princeton....and it was wonderful to see. I’m doing what newpilotfan is doing right now…..watching it all again from the DVR. Wednesday night the women knocked off #24 San Diego. Thursday night the men knocked off #22 Gonzaga. There is no way in the world that UP's basketball teams have ever beaten ranked teams in the same season, let alone on back-to-back nights.....what a wonderful gift to savor and enjoy for the many Pilots fans who have followed both teams for so, so, many years. DoubleDipper wrote: I’m doing what newpilotfan is doing right now…..watching it all again from the DVR. Ok, we got to keep this guy on the bench. Hmm, if he has some eligibility, we might want to put him in. BTW, he was on the bench with the women's team last night when they upset USD.....just saying. Such a great game to watch. Can't remember if it was Sharp's three from the parking lot or Bailey's and-one putback off his own miss that moved me into "holy crap, they're gonna win this" mode but either way, what a win for the guys. I'll be the first to say it - Reveno outcoached Few tonight. I think the Pilots came in with a game plan that they hadn't seen yet - namely, playing off Stockton and letting him shoot should he choose to take it - and couple that with the players executing and working their ASSES off put this in the win column. Can't say enough good things about the 9 guys that got in tonight. I spoke with Alec after the game….the reason he went to the locker room midway through the second half was because he was cramping up from apparent dehydration and went in for some IV fluids…..
DeanMurdoch wrote: I'll be the first to say it - Reveno outcoached Few tonight. I think the Pilots came in with a game plan that they hadn't seen yet - namely, playing off Stockton and letting him shoot should he choose to take it - and couple that with the players executing and working their ASSES off put this in the win column. Can't say enough good things about the 9 guys that got in tonight. Anybody willing to burn a DVD of this game for those of us who weren't smart enough to DVR it? Wasn't Fitzgearald their coach the last time we beat the dawgs at home ? Yes. Monson took over in 1997, and Few started in 1999. And as a special bonus, a drunk UP student hauled off and punched Dan as he was heading off the court. Not the greatest moment in sportsmanship. Ended the second longest home losing streak to a team in the nation, at 17 games. Ended a 20 game losing streak to GU. Ended a 22 game GU conference game winning streak. I have a personal account related to last night’s game. It is a bit wordy but I am hoping you will humor me by allowing me to share. My dad has been taking me to Pilot basketball games since 1998 when I was 10 years old. It started as a way for us to hang out while also watching some good local basketball. At first we would make it to a few games a year. As our pilot fandom grew we eventually became season ticket holders. I remember being impressed at how enthusiastically my dad would root for the Pilots even against his alma mater, the Gonzaga Bulldogs. When it became time for me to select a college, I eventually settled on the University of Portland. The fond memories of attending those Pilot basketball games probably had more to do with this selection than even I would like to admit. I graduated from UP in 2010. Soon after, my wife joined my dad and I as season ticket holders and the tradition continued. We learned earlier this year that my dad was diagnosed with stage 3 throat cancer. He is currently more than halfway through a 6 week chemo/radiation regiment. He has responded remarkably well to the treatment and has a very positive outlook despite the advanced stage of his cancer. You could see why I wasn’t expecting much when I called my dad earlier this week to ask him if he was going to be feeling up for the Pilot/Zag game on Thursday night. I was pleasantly surprised by his reply. I share all that with you so you have the background to understand what I mean when I say this. I have a lot of great memories of going to Pilot basketball games with my dad. That game last night has immediately become my favorite. I feel so blessed and thankful to have been able to share that with him and I will never forget it. Great story, bdaddy! Thanks for sharing. It's up there on my list, as well. I'm a 2011 graduate and former Zag fan (grew up in Spokane, didn't know any better). That game was sweet, sweet relief and one of the best played games I've seen from UP. bdaddy wrote: I have a personal account related to last night’s game. It is a bit wordy but I am hoping you will humor me by allowing me to share. Wonderful story and thanks for sharing. That is what it's all about. 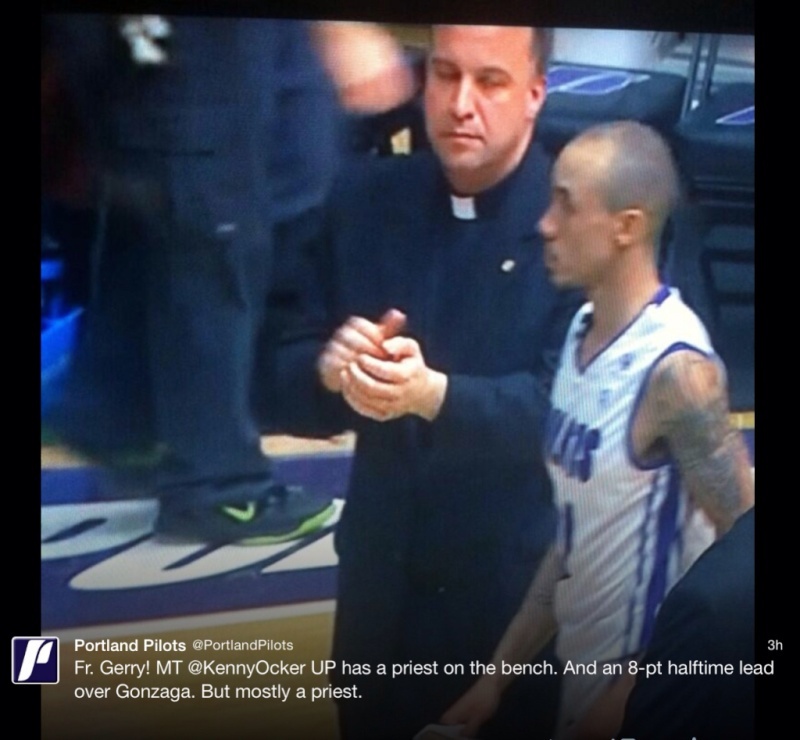 Priest on the bench? Isn't that a Jesuit thing? pilotram wrote: Priest on the bench? Isn't that a Jesuit thing? Nah, we do it at Catholic Schools, too.